a locked door is unlocked or opened in any way other than using the entry function (vehicles with smart key system), wireless remote control or mechanical key. The locked glass hatch (if equipped) is opened in any way other than using the entry function (vehicles with smart key system). Close the doors, glass hatch (if equipped) and hood, and lock all the doors. The system will be set automatically after 30 seconds. Open the glass hatch (if equipped) using the entry function (vehicles with smart key system). The windows and the following openings are closed before the alarm is set. 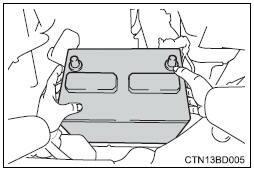 A person inside the vehicle opens a door or hood, or unlocks the vehicle using a inside lock button. The battery is recharged or replaced when the vehicle is locked. when a person inside the vehicle triggers the alarm by unlocking a door or the back door. When a person inside the vehicle unlocks a door or the back door while the alarm is operating.